Event Décor Direct prides itself in being Indiana’s top provider of expert wedding and event decorations. With our wonderful selection of choice, quality, stylish and affordable decorations, we are sure to be able to provide top wedding planners and event planners needs. While Event Décor Direct is widely associated with weddings, our event decorations are great for any type of venue. Nightclubs, theater productions, schools and restaurants are just a few of our customers. Wedding Backdrops - With our fantastic selection of backdrops, you will be able to transform your Indiana wedding venue into the room of your dreams. The tall, stately Greek columns combined with the beautiful arched window frames will provide a gorgeous setting for that special day. We also carry starlight windows for that romantic look. Our wide selection is sure to have something that you will like. Backdrop Lighting - While our wedding backdrops are stunning on their own, add our backdrop lighting for a truly spectacular look. By using LED products, any color in the rainbow is available for lighting your backdrop. Our LED products include basic par cans, LED par cans and LED bars. Add our colored gels to add color and create your once in a lifetime Indiana event. 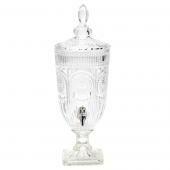 Crystal Décor – If you are looking for bling, we have it. With our fantastic selection of crystal décor, you can create a crystal wonderland for your special event. From individual crystal drops to complete crystal trees, you can combine any number of different crystal elements to make your crystal fantasy come true. Your IN wedding will be a remembered for a long time when it is showcased with our beautiful crystal décor products. Chandeliers – If you are looking for the beauty of crystal chandeliers but cannot afford the price, Event Décor Direct has the perfect alternative. Indiana wedding and event planners will love our selection of beautiful acrylic crystal chandeliers that provide the look of glass crystal without the high price. Crystal Curtains - Crystal curtains create the look of a shimmering waterfall and are sure to be remembered. 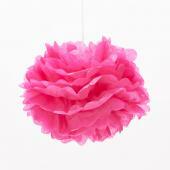 With our wide variety of shapes, sizes and colors, you are sure to find that perfect look for your special event. 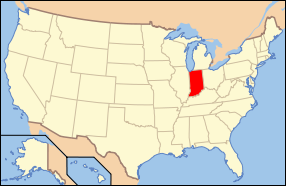 We take great pride in being Indiana’s premier supplier for crystal curtains. LED Decorations - LED decorations are the current trend in weddings and events today. Event Décor Direct is proud to provide Indiana with its large selection of LED decorations. We carry garlands, bouquets, branches and chandeliers that are sure to be that special touch for your special day. Candles - Candles are always a popular choice in decorating many special events. Their warm glow adds a soft light that is both inviting and romantic. 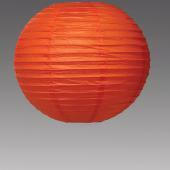 Event Décor Direct provides top Indiana wedding and event planners with a vast variety of candles. 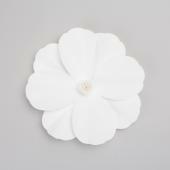 Rather you are looking for simple tealights or today’s smart candles, you are sure to find it here. 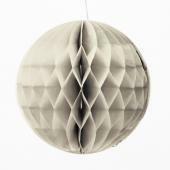 Do not forget to check out our selection of candleholders. We are sure to have what you want for that special look at your Indiana wedding or event. Ceiling Draping – Ceiling draping can create a rich look on one of the most neglected parts of the event room. 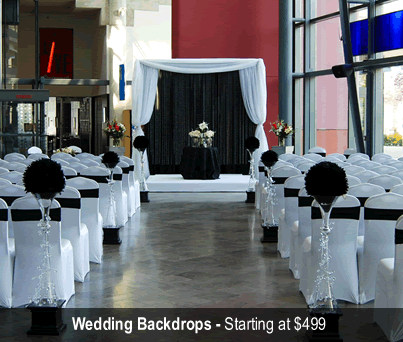 The lovely hanging drapes will make your Indiana wedding really stand out and leave your guests talking about its beauty. 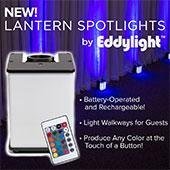 Our kits contain everything you need to turn your Indiana event into a real stand out. 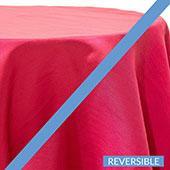 Chair Covers – Event Décor Direct provides Indiana with a wonderful selection of chair covers. 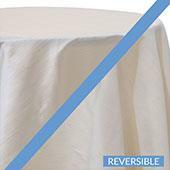 Chair covers really pull a room together during your special event. They soften the look of wood or metal chairs and provide a uniform appearance across the entire room. 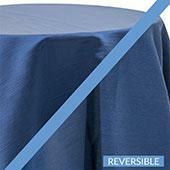 Indiana wedding and event planners will have a choice of fabric, style and size that will be sure to meet their needs. Whether you are looking for full chameleon wrap chair covers or beautiful bows to drape your chairs you will find it here. 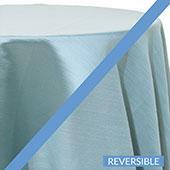 Event Linens & Drapes – Today event linens and drapes are a part of many wedding and event decoration themes. 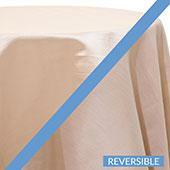 Our selection of drapes and linens are affordable and popular in Indiana. With our selection of styles and colors, you are sure to find the right combination to make your special day even more special. Pipe and Drape - Event Décor Direct is proud to provide Indiana with complete pipe and drape kits. With these kits, you will have everything you need to create beautiful draped walls, both inside and out. By providing the kits, we eliminate the possibility of not having everything you need to finish your draped walls for your Indiana wedding or event.